Outcry Youth Theatre presents a brand new adaptation of Jules Verne’s classic novel 20,000 Leagues Under the Sea, with a twist! Professor Pierretta Aronnax joins an expedition to capture and kill an unknown sea monster terrorizing the seas. Along with harpoonist Ned Land and her assistant Conseil, she learns that the creature is actually an ingenious underwater vessel, the Nautilus. They are captured by the mysterious Captain Nemo who takes them on marvelous adventures. But what surprises lurk in the undiscovered depths? The cast of twenty-five exceptional youth actors hailing from Ft. Worth to McKinney includes award winning youth actors Brayden Soffa and Elizabeth Belilty. The show will also feature more than a dozen puppets, including a very large shark and a 10-person puppeteered goliath squid. Tickets are on sale now at: https://www.outcrytheatre.com/20000-leagues-under-the-sea. $10 for General Admission; $20 For Premium Reserved. Tickets may also be purchased at the door. 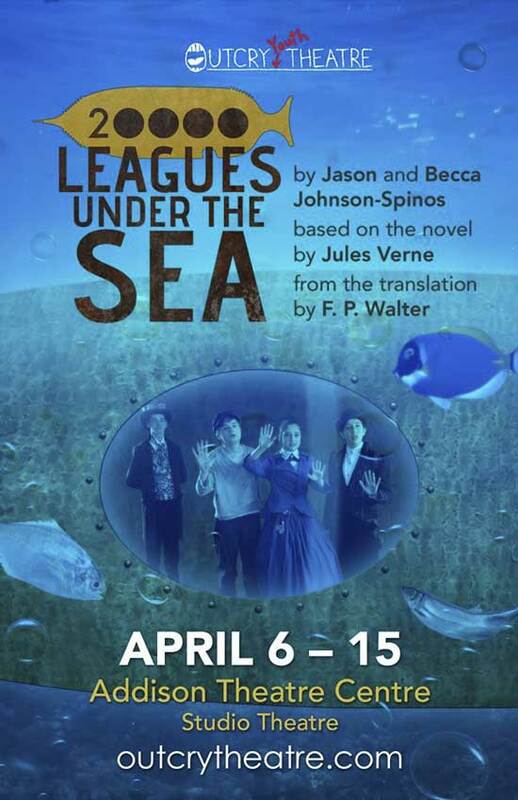 Outcry Theatre’s presentation of 20,000 Leagues Under the Sea will play from April 6 – 15, 2018 at the Studio Theatre at the Addison Theatre Center. Keep up with the buzz on Facebook.